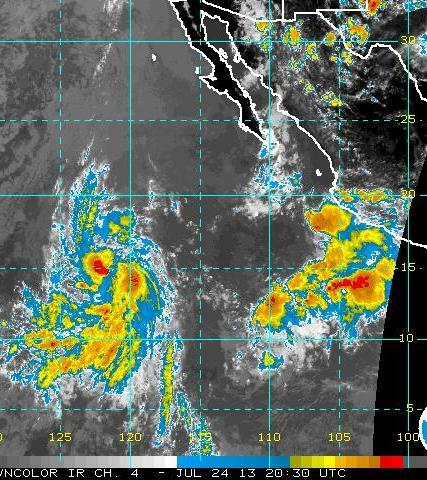 First - there is a new Tropical Storm in the eastern Pacific this morning, TS Gil (see above). Gil is forecast to become a hurricane during part of its life, as it moves generally off to the west. TS Flossie dissipated over the Hawaiian Islands on Monday. Apparently the storm was weaker than forecast, as per headline in Hilo newspaper - "Flossie Fizzles." Suppressed conditions continued yesterday - graphic below shows lightning strikes through 5 am MST this morning - note that there were several strikes out in central Pima County. However, most of the CG lightning occurred over northeast Sonora, south of the border. 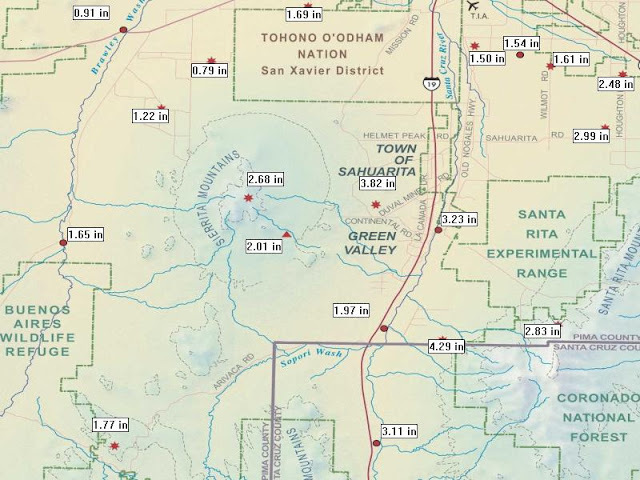 This morning at 6 am none of the ALERT stations in eastern Pima County reported any rainfall during the past 24-hours (third consecutive day with no rain at all over the network). This morning skies are clouded over with middle and high clouds from the activity over northern Mexico - above is visible satellite image at 6:15 am MST. At that time there were still some light showers moving westward along the Borderlands. A skew-T plot of the 12 UTC TUS sounding is shown below. Even though PW is now up to around an inch and a half, there is little CAPE available at low elevations. Winds are easterly in mid-levels and southerly at high-levels and a bit stronger in the upper-troposphere. No forecast from the early WRF-GFS this morning. The latest (12 UTC) NAM analysis at 500 mb is shown below. The model analyzes a weak trough over northwestern Mexico. This feature does not show up in the analyses above 400 mb, nor below 700 mb, and it is thus hard to assess what exactly might be there. There has been substantial cloud cover and storm activity over northern Mexico the last two days, so something is likely there. The NAM forecasts this feature to move northward and be nearly over Tucson by midnight tonight. The NAM also forecasts most significant storms and rain to occur along the Borderlands this afternoon and evening. Considerable uncertainty present today. It was very suppressed across almost all of Arizona yesterday with lightning strikes detected occurring only along the Utah/Arizona border. This morning PW continues to increase across southern Arizona - above is 13 UTC CIRA blended PW with color bar. Morning PW at TUS is 32 mm. Note that values of 50 mm and higher cover almost all of the GoC. Middle-level temperatures have now increased some and are around -5 C or so at 500 mb from Tucson east and southeastward. Thus, little CAPE indicated for today except along the Borderlands and in northern Mexico. There is an inverted trough at 500 mb over northern Mexico. because of the huge, summer-long, data void over northwestern Mexico, it appears that this morning's NAM has this feature too weak in its analysis and forecasts. Regardless, the feature will be moving across northern Mexico and southern Arizona the next two days. Another inverted trough may impact the southern GoC by Friday and result in at least a moderate surge of GoC mT air into southern Arizona. Southerly winds are strong this morning at Yuma. The early WRF-GFS forecast from Atmo indicates little precipitation for southern Arizona this afternoon - below is rainfall forecast through midnight. I suspect that this is under-done along the Borderlands and northern Mexico. Undoubtedly, the weather will gradually become more interesting as the week progresses. Meanwhile, 100+ temperatures have made a return. The above time series shows GPS PW at Univ. of Arizona versus NWS TWC RAOB PW for July 2013. Note that the new Vaisala RS92 sonde provides data that are much more in agreement with the GPS data. 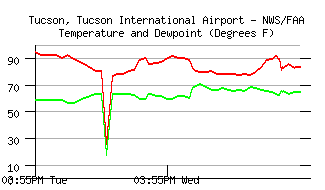 A much improved situation here at Tucson NWS. Every once in a while the new sonde data produce PW values that are a bit higher than GPS values. A complete turn around from the overly dry data before the change. Yesterday was quite suppressed over most of southeast Arizona, with only a few lightning strikes in far southeastern Cochise County (above is 24-h CGs ending at 6 am MST this morning). No stations in the Pima County ALERT network reported rain. The dry air intrusion has not pushed the moist air mass very far south in Mexico and model forecasts indicate a quick return into southern Arizona. Above is the 12 UTC WRF-NAM forecast of PW valid at 8 pm tomorrow evening, indicating values returning to over 40 mm over the west half of Pima County. The 12 UTC WRF-GFS forecast indicates some storm activity tomorrow afternoon along the Santa Cruz and Pima County Borderlands (forecast below show composite radar echoes at 5 pm MST Tuesday afternoon. So, if the models are more or less correct, the afternoon storm activity will quickly be on the increase this week. There was still quite a bit of activity across eastern Pima County yesterday, as the plot of lightning strikes for 24-hours ending at 6 am MST this morning indicates (above). 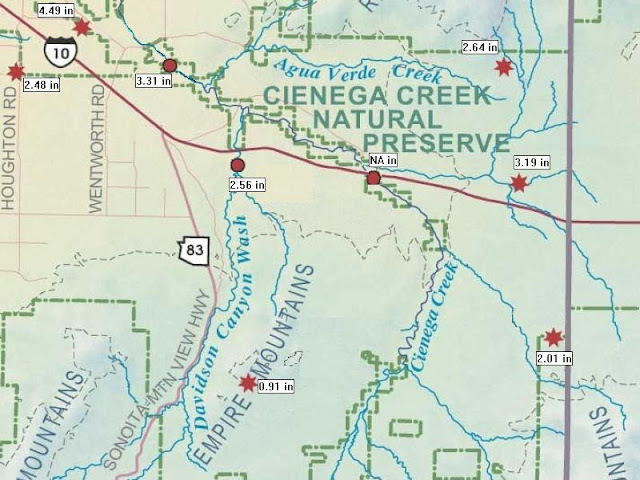 Across the ALERT network 30 of 88 (34%) reporting sites had rainfall, with some heavy amounts at high elevations and along the eastern edge of the network. There were 9 sites with 1/2" or more rain and 4 sites had over an inch. Here at the house we had thunder and a cool outflow during the afternoon, but only a few spits of rain (Trace). The morning plot of the 12 UTC TUS sounding (above) indicates perhaps a sliver of CAPE this afternoon at low elevations. There is probably enough lingering moisture for there to be better CAPE and some buildups over the mountains this afternoon. Flow is westerly through the troposphere and PW has decreased to 31 mm - the lowest value in many days. The 12 UTC NAM 500 mb analysis (below) shows that the 500 mb ridge-line has been pushed south into northern Mexico and that it extends westward across the central GoC. Cooler temperatures are moving over the Southwest from the Pacific trough, so when low-level moisture improves a bit CAPE may develop more easily at lower elevations than it did during the extended period of tropical-like conditions. The Atmo WRF-GFS apparently did not run this morning. Finally, TS Flossie continues moving westward in the Central Pacific, with the current outlook (above) taking it across Hilo and the north end of the Big Island. Dorian has weakened in the Atlantic and is no longer a TS. 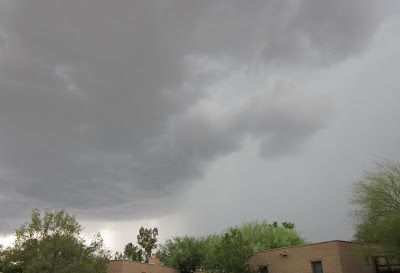 Heavy storms moved across some parts of the Tucson area yesterday afternoon. The photo above (taken at about 2:20 pm MST) is looking south from the house at a storm that seemed to be coming this way. It produced heavy rains and a wet microburst that did roof damage and took down power poles near Fair and Park, a bit north of the airport (Trace at TUS and no winds, but DM reported gusts to 52 mph from the northwest and 0.58" of rain). Here at house we had gusts from the northwest of 45 to 50 mph out of a storm over the west end of the Catalinas. This outflow apparently led to new cell development to the east of the storm in the photo, so that we just had some spits and sprinkles that amounted to only 0.03" here. Graphic below shows lightning strikes for 24-hours ending at 6 am this morning. There was considerably more storm activity over central and eastern Pima County than forecast by the early WRF-GFS (for second straight day). So we have the question again of how well the model forecasts for today will be. 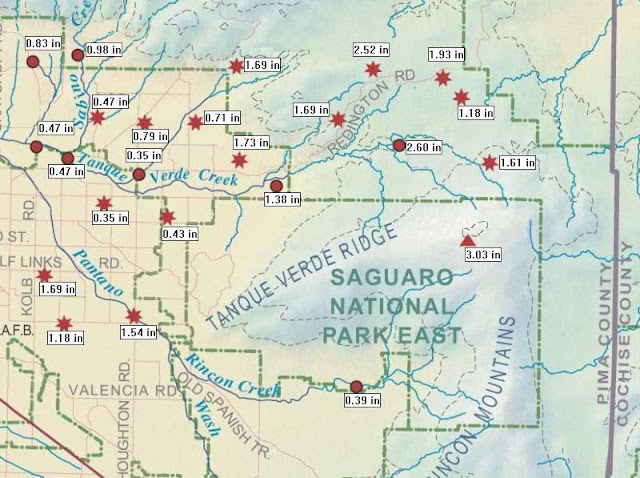 Across the ALERT network 48 sites had rainfall (52%) with 13 sites having 1/2" or more, 8 sites with over an inch and 1 site with just over 2 inches. Almost all the rainfall occurred before 5 pm yesterday afternoon. The morning skew-T plot for the TUS sounding is fairly similar to yesterday's and remains very moist and with a chopped up, light and variable wind profile.The CIRA blended PW product (below for 6 am this morning) continues to indicate a large area of high PW over southern Arizona and the lower Colorado river Basin. There are signs of drier area intruding into the northern GoC and the forecast issue for today will be how quickly the drier air will invade southern Arizona. Skies are quite clear this morning, so the day is starting out differently than the past few days. The models forecast the 500 mb anticyclone to consolidate over northern Mexico by tomorrow, bringing a dry-out from the south and southwest for much of the Southwest. The PW trends today will provide the information relative to the how quickly the transition to drier air will occur. The early WRF-GFS again forecasts a mostly down day across Pima County. But the forecast 6 pm TUS sounding for this afternoon again shows over 1500 j/kg CAPE and PW of 41 mm. Expect that storm activity will again exceed the forecast coverage, but key will be by how much. Steering flow may increase some by evening and be from west to east. The extent of the drying forecast by the early WRF-GFS is shown by the forecasts of PW valid at 6 pm MST tomorrow (above) and at 6 pm on Monday the 29th (below). There was a considerable increase in thunderstorm activity yesterday, much as indicated by the morning NAM although not as widespread. The early WRF GFS was too suppressed. Strong thunderstorms developed over the mountains by 11 am MST (above image of Catalinas is at 11 am). Lightning strikes for 24-hours ending at 6 am this morning are shown below. 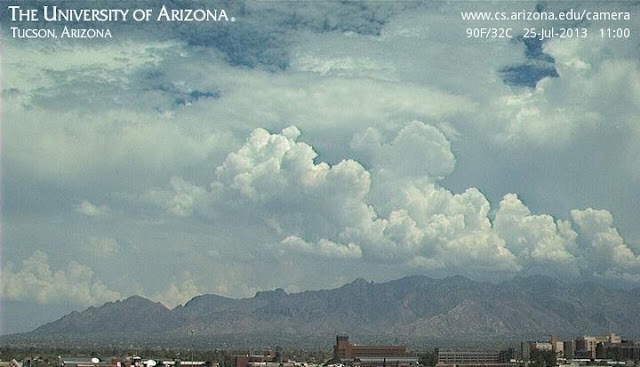 CGs were mostly over mountains near and east of Tucson, but eventually some storms occurred at lower elevations west and north of Tucson. Some of these produced heavy rain, but they also spewed out widespread anvil cloud. Here at the house, after a sunrise sprinkle of 0.01", the day was mostly overcast with no storms at all. Across the ALERT network 46 sites (50%) had rainfall during the past 24-hours. 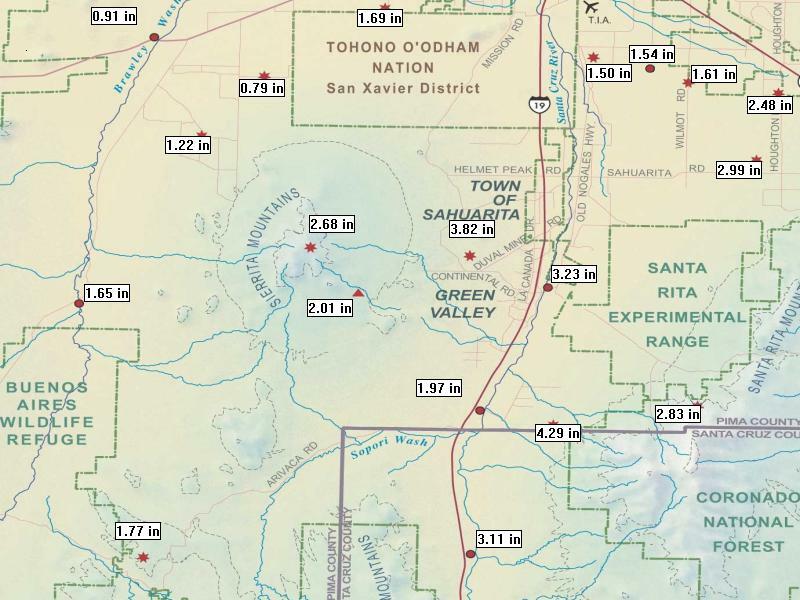 Ten stations reported over 1/2" of rain and two in the Catalinas reported over 1". Today will be a transition toward drier conditions over the weekend. Currently clouds and showers are widespread across southeastern and central Arizona - above is visible image at 6:45 am MST and below is Tucson composite radar a bit after 7 am. The morning skew-T plot of the the TUS sounding (below) continues to show a very moist and unstable atmosphere. Winds are very light westerly through the sounding. Both the early WRF GFS and the new NAM forecasts indicate little storm activity this afternoon, after the current activity moves to the west and north. This is apparently due to subsidence produced by the consolidation of the western, 500 mb anticyclone to be nearly overhead by this evening, although there continue to be two weak circulation centers with one located south of Tucson. The sinking air produces slow drying during the afternoon, followed by a more substantial dry out forecast by the models over the weekend, as the anticyclone is pushed southward into northern Mexico by an eastward progression of the trough west of California. I note that the early WRF GFS still forecasts an unstable atmosphere over Tucson at 6 pm this evening with PW of 39 mm and CAPE of >1600 j/kg. So, some caution is needed as well as a careful look at the new WRF forecasts later this morning. Looks like both Dorian and Flossie are heading for vacation spots as per latest NHC forecasts. Dorian (above) appears to be headed for the beaches of Florida, while Flossie (below) may visit the Big island. An unusual occurrence in the Tucson time series of T and Td yesterday - the bitter cold one hour was apparently the result of the data somehow going into the plot in C rather than F.
Skew-T plot of the 00 UTC sounding from TUS is shown above. The sounding had only a sliver of CAPE due to the warm temperatures above 550 mb. The sounding fits well with what was observed last evening. Storms tried to move off the Catalinas and Rincons around 7 to 8 pm, but with little CAPE they weakened over the metro area. Here at the house there was some in-cloud lightning and rumbling thunder with light anvil/debris showers. There was a fairly strong gust front from the east at about 35 to 40 mph around 7:45 pm MST. Total rain from the decaying storms was only 0.05" here. Across the ALERT network 44 sites (48%) had rain, most of which fell over the east part of network and after 5:30 pm yesterday afternoon. 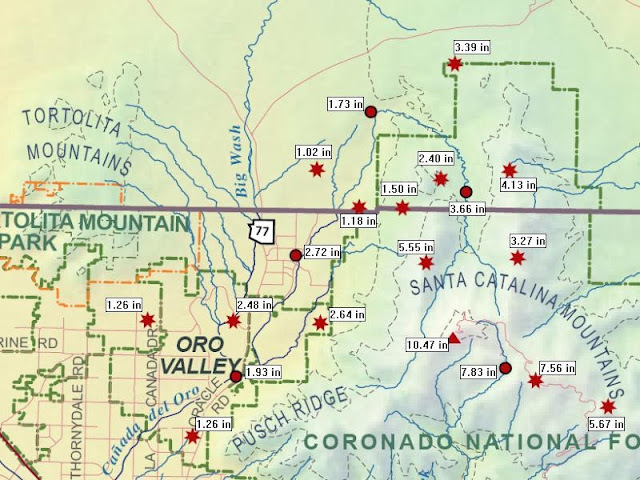 There were 9 stations with amounts of 0.25" or greater and highest total was 0.43" at two sites. The plot of lightning strikes for 24-hours ending at 6 am this morning shows a few strikes in the east part of the metro area, but with more strikes in higher elevations of Cochise County and much more activity to the north and across New Mexico. This morning's sounding plot for Tucson (above) indicates cooling through that warm layer that kept things fairly suppressed yesterday - so, a key question is whether this cooling and substantial increase in CAPE will actually persist through the afternoon. 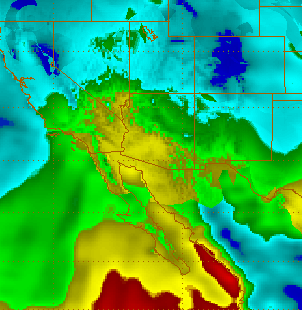 PW continues very high with values of 1.75" and greater across all of southern Arizona. But winds aloft are light and from the east - so little meaningful steering flow. The 500 mb anticyclone continues to have two distinct circulation centers (one over Nevada and one over west Texas) with a weak trough/deformation zone between that stretches from south Baja northeastward to eastern Colorado. There is just a single anticyclone at 250 mb and it is nearly overhead. 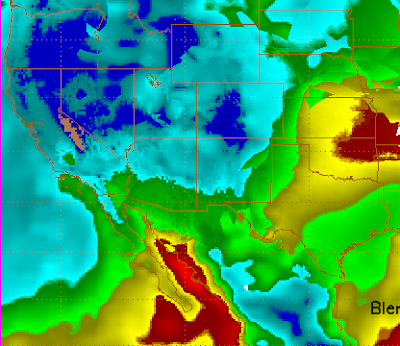 The early WRF GFS (above) forecasts a mostly down day over much of southern Arizona, including all of Pima County. The WRF GFS forecast does not develop much CAPE across Pima County this afternoon. However, the latest NAM (below) forecasts a big storm and rain day for all of southeast Arizona.Both forecasts show rainfall though midnight tonight. Plenty of complexities, including abundant morning clouds, continue and it will be interesting to see what the new WRF forecasts show. The early WRF-GFS forecast actually did pretty well with the morning convection, although the showers did not produce as strong an outflow as the model predicted. The new WRF-GFS run with 12 UTC intialization appears more accurate than the WRF-NAM, which has much more convection forecast than is occurring. So, perhaps a blend of the two versions of WRF-GFS will work out best for today. The above graphic is forecast of composite radar from the am WRF-GFS valid at 7 pm this evening. Below is am WRF-GFS forecast of rainfall through midnight. The later forecast is more conservative along the Borderlands, since it didn't pick up the morning convection as well as the midnight run. Tough day and we'll just watch to see what transpires this afternoon and evening. Looks like TS Flossie may be forming well southwest of Baja - near 15N and 120W (see IR image below). Meanwhile TS Dorian has formed over the eastern Atlantic. Yesterday was another suppressed day for much of southern Arizona, with storm activity mostly east toward New Mexico - above plot shows lightning strikes for 24-hours ending at 6 am MST this morning. Across the ALERT network only 1 site had light rainfall (1% areal coverage). Still waiting for the first meaningful rain of summer (say 0.25" or more) here at the house, making this a very bad start to the monsoon season here in north part of town. This morning the larger-scale setting has become a bit more interesting, as winds in middle-levels have increased and an inverted trough at 500 mb has sharpened some. The chart above is the NAM 500 mb analysis for 12 UTC this morning. The large anticyclone has at least two centers of circulation - one is over northeast New Mexico and the other is over California, south of San Francisco. The inverted trough has become more pronounced between these two features. The NAM forecasts little movement, other than an elongation to the northeast across New Mexico, of the inverted trough, as it remains stuck between the two anticyclone centers through 24-hours. So it appears that northeasterly steering winds will remain at about 20 kts or so today. PW remains high but middle level temperatures remain warm - so best CAPE occurs over higher elevations again. The early WRF-GFS forecasts an upturn in thunderstorm activity for southeast Arizona today. The model keeps PW high through its forecast and also forecasts CAPE to exceed 1500 j/kg early this afternoon at TUS. The model forecast of rainfall through midnight tonight is shown below, with highest amounts forecast north and east of the Catalinas and along the Borderlands. However, the conditions early this morning may be impacting the model forecast. It forecasts the development of morning storms that move along the Borderlands - the above is model forecast rainfall though noon today. The 10-m winds forecast for 2 pm this afternoon are shown below, indicating a strong outflow from the morning storms moving northward across eastern Pima County. This ouflow then affects the evolution of storms during the rest of the afternoon. This morning there is heavy middle cloud across most of southeast Arizona, and the model may have forecast too much heating over Pima County by mid-day. There are, however, currently some showers indicated by radar near Benson and also east of Nogales - so the early WRF-GFS can't be completely discounted at this time. But, a check of the morning WRF forecasts will certainly be needed once those forecasts become available. Below are maps of the other two sectors of the ALERT Network showing past 30-day rainfall. 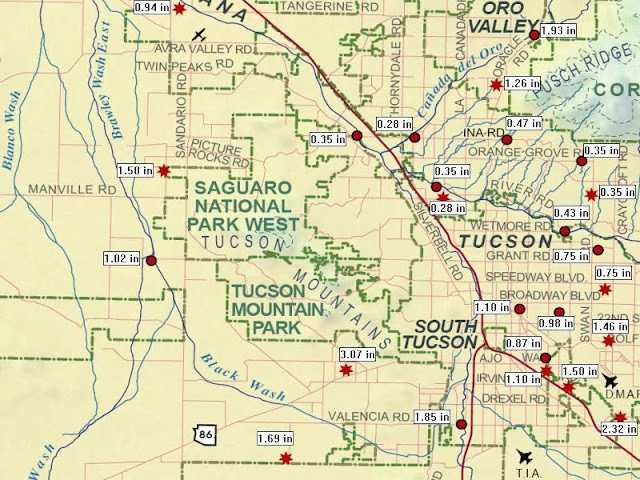 Rains have been generally heavy to the south when compared with the north parts of metro Tucson. Plot of lightning strikes for past 24-hours ending 6 am MST today (23 July 2013) is shown above. Another very quiet day across almost all of Pima County. At 6 am this morning the ALERT network data indicate that 13 of 92 sites (~14 %) had rainfall during past 24-hours. Most were high elevation sites and 11 of the reports were for rain occurring before 5 pm yesterday afternoon. Very little change during past 24-hours. Atmosphere remains moist with PW values of 1.50 to 1.75 inches across southern Arizona; 500 mb temperatures this morning are warm at -4 to -5 C; and winds through the troposphere are light and variable. 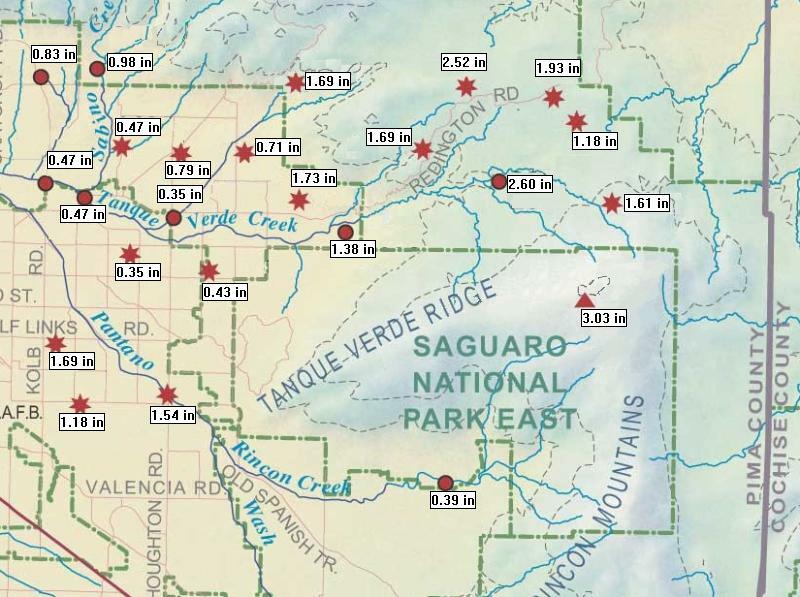 The early WRF-GFS forecast a few showers in eastern Pima and Santa Cruz Counties this afternoon, with more activity forecast over Cochise County (map below shows forecast rainfall through midnight tonight). Synoptic situation is basically blah today. The ALERT site has a number of interactive capabilities and I used these to generate 30-day rainfall totals ending at 6 am MST this morning. Below are three of the sector maps - top is Catalinas, middle is Rincons and east metro, and bottom is west metro. 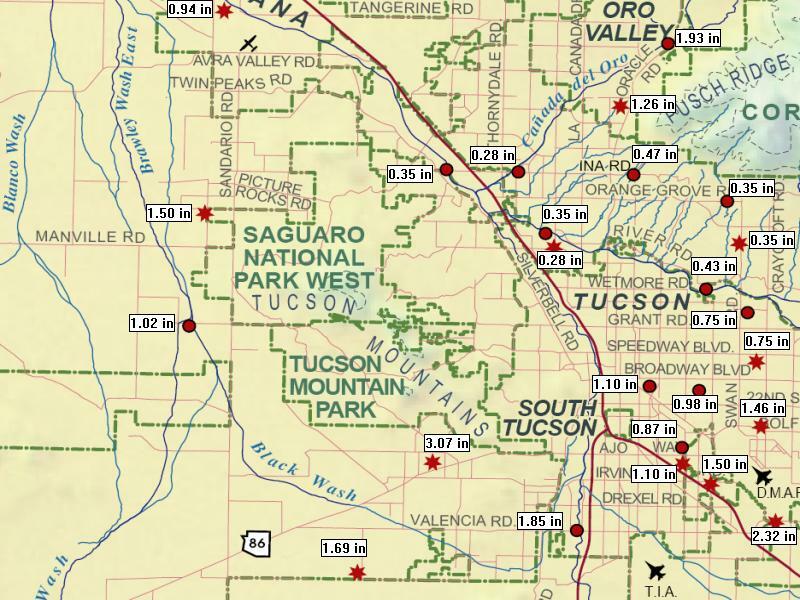 Most rainfall so far this summer has been in the Catalinas and along the I-10 corridor. 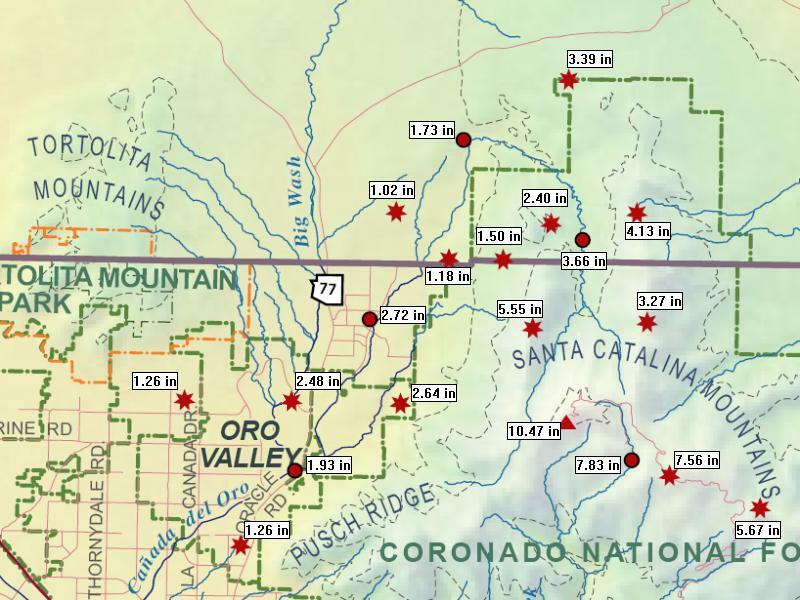 Amounts have very large gradients with minimum of 0.28" west of the Catalinas and maximum of 10.47" at Mt. Lemmon.